1. — Hands down, this is Kaitlynn’s (almost 3) favorite book. In fact, I’m pretty sure every single one of us have this entire book memorized by heart. We also can pretty much tell you every little detail on every square inch of every page. But that’s perfectly okay, because it’s such a great classic book. 3. — If I had to pick a favorite book from all the children’s books we own, I’m pretty sure this book would be it. It’s a beautiful story of God’s love for us — even when we were yet sinners. It touches me every time I read it to the girls and opens up lots of opportunities for me to explain truths about God. 4. — This is a true and fascinating story which happened in 1783. A 3-year-old girl gets lost in the woods and is saved by a bear — yes, I said a bear. The girls are always in awe and ask dozens of questions when we read this one. This post is brought to you in part by HarperCollins and the . Kids 12 and under can join the and earn a free book when they read 10 books. Just and bring it in to any Borders, Waldenbooks, or Borders express store by August 26, 2010 to participate in this program. Find more Summer Reading Programs here. Looking for more? Read more posts about Frugal Fun. I’m SO looking forward to this series! I loved The Seven Silly Eaters as a kid, and Goodnight Moon was always a favorite, too. I’ll have to check out The Bear That Heard Crying as well. My daughter’s finally at the point where she enjoys being read to (instead of just chewing on the books), so I’m having a lot of fun finding books for her. Anybody have any recommendations about which of the free books would be a good choices after my kids earn them? Sounds like a fun program. My all time favorite books to read aloud have been the ones by Karma Wilson. Bear Snores On and Mortimer’s Christmas Manger are my two favorites. 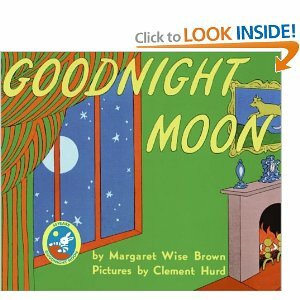 Good Night Moon, hands down, was each of my kids favorite book. It’s been 15 years since I’ve read it to one of them and I still remember then entire book by heart. I don’t know if The Quiltmaker’s Gift is going to make your list, but if you haven’t read it, you should. I know you and your children would love it! On another note, someone gave my son Max Lucado’s book “You are Special” as a birthday gift. I thought it looked good but over his head (3 years old); I thought he would enjoy it more down the road. I was wrong; it is one of his favorite books and he has it almost completely memorized. 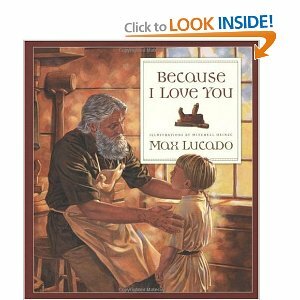 Maybe “Because I Love You” can be one of his Christmas books! I will have to check out “Because I Love You”–that sounds like a great one to own! 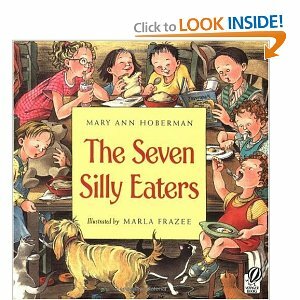 “Seven Silly Eaters” sounds like a really fun book, too. “The Bear that Heard Crying” is such a great book, and especially neat for our family because it took place not too far from where we live! For older children, there is another book called “Sarah Whitcher’s Story” by Elizabeth Yates, which goes into a little more detail about the same story. Thanks for this series; I’m really looking forward to reading the rest of your list! @Carrie, Don’t feel bad – I never read Goodnight Moon either until I had kids, but it is a great book – I think it sounds better the more you memorize it. My 3 yr old LOVES being read to and we go to the library for new books weekly. Sometimes I walk in there and feel so overwhelemed – a couple of these are new to me so I just went online and reserved at my library. Will pick up this weekend and cant wait to read them with my little one!! 🙂 Thanks! Is the Borders program only for readers? The “12 and under” makes me wonder if they can be listeners. The books are all for older kids from what I can tell, but I would start reading them to my kids before they could probably read them to themselves. @Sarah A., I just went to Borders today, with my children. The book choices are a lot older than the Barnes and Noble ones. They only have 2 younger choices, and my 5-year-old was bummed because they are above his reading level (and we already own one of them). I will have to read the other one to him. Barnes and Noble was right across the street; I only had my two older children do that one (since it said grades 1 and up); they had more book choices, and many choices for the younger readers, which was nice. They also didn’t limit us to choosing by grade level, so the children chose the books they wanted to pick. How funny — I just saw Seven Silly Eaters for the very first time today when Nutmeg brought it home from a friend’s house. She wanted to borrow it so we could bake the cake described inside. Fortunately, she accepted my explanation that I couldn’t make it since there was no recipe in the book! Thank you; I think my six small children will like the Seven Silly Eaters! I reserved that and The Bear That Heard Crying from our library. I have a favorite homeschooling blog that I like to read. She recommends lots and lots of books there and I LOVE her choices, for both herself and her children. If you aren’t already reading her blog, I highly recommend it! Such a small world!!! I grew up with that mom! (I was more friends of friends…) I didn’t know that Heidi had such a web site. Thanks for recommending it! We *Love* Seven Silly Eaters. Mary Ann hoberman has other great books and poetry. 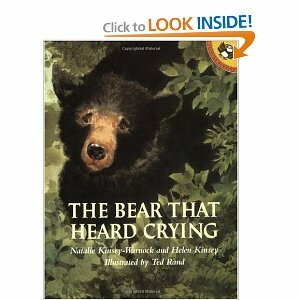 A longer book that is probably the same story as the bear who heard crying is the Sarah Whitcher Story. Even if the book choices are for older children, does anyone know if they can be listeners and do it? I just figured we could add to our collection. We loved many of those books when my kids were little. One of their all time favorites was “Caps For Sale”. I can’t tell you how many times we read that one! Please don’t forget that BARNES & NOBLE has a SUMMER READING PROGRAM as well. Read 8 books, get one book free. Kids get to put their own special sticker to put on a world map and talk to a bookseller about their favorite books. @Bodestrade, We went today to get our books; no one said anything about the map, though. They just got to choose their books. They had lots of choices, though! The woman checking us out asked one of my children what his favorite book was, and she wrote it down, but she didn’t ask the other child for a favorite. (She had to write down their favorites, for the store, apparently). I love getting new ideas for read alouds! My oldest is old enough now that he really enjoys chapter books too, which are fun to read! Thanks, looking forward to the rest! What a great list! Most of them I have read already and enjoyed. But The Bear that Heard Crying is new to me; I am certain my kids will love it! Have you read the book Fool Moon Rising? A Good friend just recommended that to me and it looks really good! “Goodnight Moon” is the absolute best. My daughter is now 16, and STILL remembers that book. Not too many books can you say that about! We were just talking about it the other day. It was a book we read over and over and over!!! My gang absolutely loves Seven Silly Eaters, the pictures are fantastic! Wow, your timing is perfect! I’ve been looking for some more books to read to my son. 🙂 He LOVES books. Goodnight Moon is a definite classic. My son and I both know the book by heart! Library Summer Reading program starts today we are so excited! 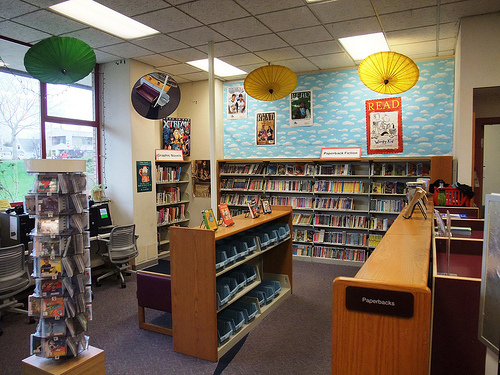 That picture you’ve used of a kid’s library is from our town! It’s a wonderful place. My kids love The Bear that heard Crying. Many years ago I heard the author speak at a library conference and just fell in love with her and her books. It was a pleasant surprise to see it on your list. Great post–always looking for good books. Two are favorites of ours–the other 2 we will be checking out of the library! I am so excited to see this series of posts. My 2.5yr old is book crazy. She would give up all her toys for a good book. Often she spends hours sitting in a box with her animals and a stack of books reading them. I’ve been reading her books since the day she was born ( well she herd them daily when I was pregnant since I was teaching then if you want to get technical). I was amazed that even at 3-4 mos she was in love with stories and even had favorites she could pick out from a stack of other books/toys. I will definitely be looking for some of these books at the library, though we rarely go there. We usually purchase books/videos instead at a steep discount via the 3x weekly book sale run by the friends of the library. Nothing like getting $10 hardcover books in like new condition for $1. “Big Plans” by Bob Shea!! It’s a HILARIOUS read. The Pigeon books by Mo Willems were a hit. And I personally love “God Gave Us You” by Lisa Tawn Bergen (probably not at the local library, but a wonderful story none the less). I think if you put enough energy and funny voices into a book, any of them can be a good read aloud. I’m a Children’s Literature doctoral student (code for unemployed and broke and this website has stretched my budget way far)! Back to the topic, I really liked all the suggestions and have just one more. If you have an 8-11 year old and they haven’t read The Invention of Hugo Cabret (it’s a 500 page half picture have writing) book, they must! It’s a great read and the page numbers would give them the satisfaction of reading a 500 page book. Even though it’s really only about 40 combined pages of actual words. A nice transition from picture books to novels. and of course…You are Special by Max Lucado…. The Tale of Three Trees is a wonderful book too! I hope that you have all read “A Chair for My Mother”. Besides being a wonderful story with beautiful illustrations, the story of saving money and waiting until you can afford an item of importance is portrayed in a lovely way. Thanks you so much for the recommendation on The Bear that heard Crying. I just got it at the library and it is great. Both my 6yo and 3yo boys loved it.